My friend Katie, who met up with Alex and me at the game on April 9th, works for Paragon Marketing Group in Chicago. 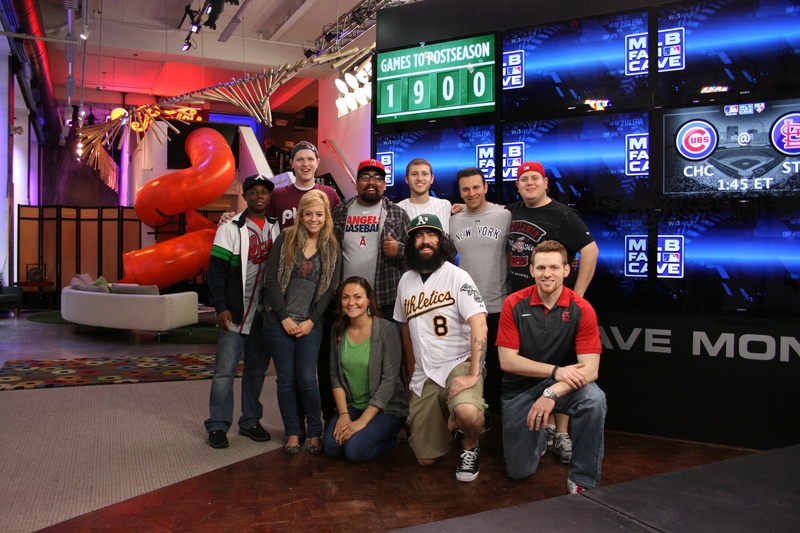 She has a bunch of contacts, and she hooked me up with an MLB Fan Cave tour. David and I left Luke’s place around 9:45 and stopped at Brooklyn Label, a coffee shop in Brooklyn. I paid $5 for fresh squeezed orange juice, and I think it was worth it. I’m always a little skeptical that it’s just Tropicana OJ with a lot of pulp or something. 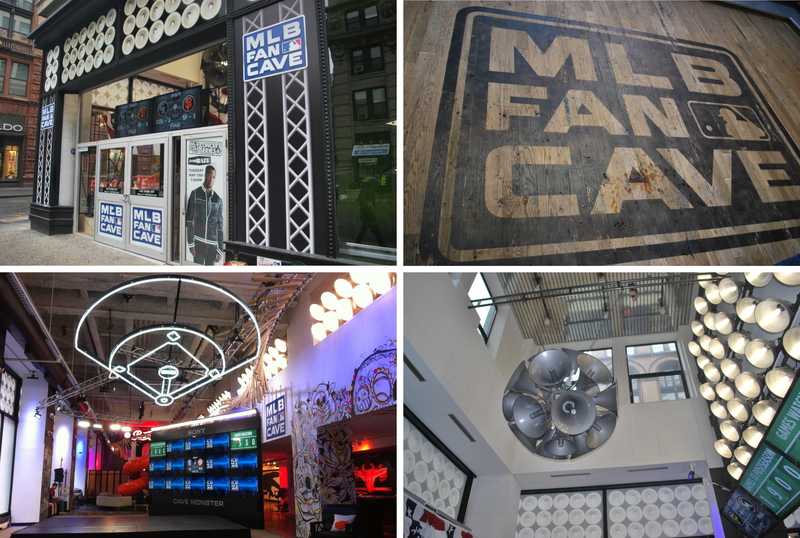 1) The exterior of the Fan Cave, located on Broadway and 4th in Manhattan. 2) The floor with the Fan Cave logo as you walk inside. 3) The foyer, if you will, as you enter off the street. 4) The main level of the Fan Cave, as seen from right inside the entrance, the Cave Monster looms in the distance. 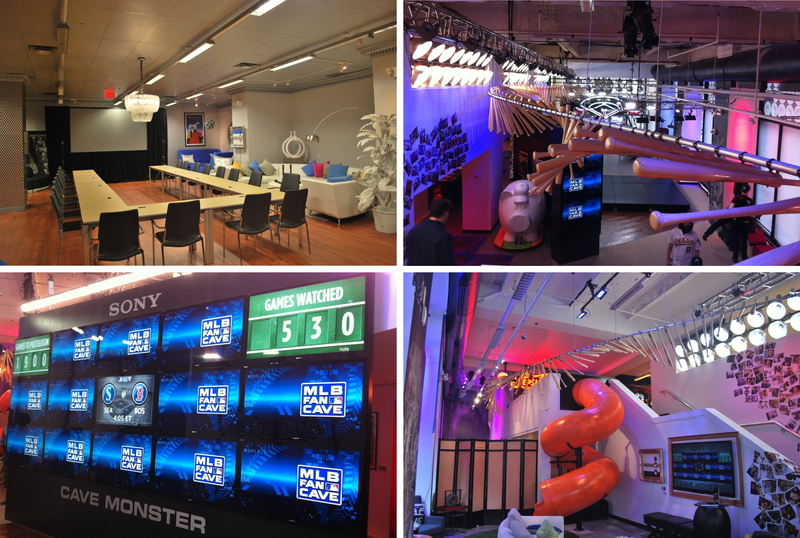 I realize that some of you may not know what the MLB Fan Cave is. In short it’s nine people who are watching all 2,430 Major League Baseball games from this very location. The cave dwellers don’t live there, but they do all live together in an apartment building nearby. 1) The Pepsi Max wall. Pepsi sponsors Major League Baseball, and they’ve had some cool commercials with old and new ballplayers alike. On the far left you can just make out the edge of something, it’s a cooler stocked with Pepsi Max. 2) Part of the game area, there is also table shuffleboard and a Skee ball game. 3) The Signature Wall. 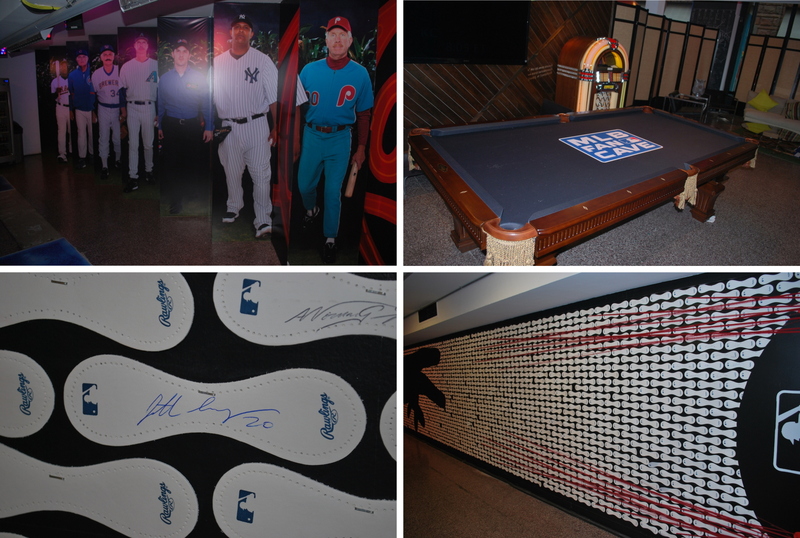 When MLB players come to the Fan Cave they sign the wall, on one of the “baseballs”. 4) Jonathan Lucroy’s signature, who was at the cave on Monday. He’s the Brewers catcher, and it would’ve been cool to be there when he was, but being there without any players was cool in itself. 1) The basement. Lenny, who was giving me and David the tour, said that last year it had been darker and more dance-club-ish, but now it’s more of a formal meeting area. Major League Baseball was going to be hosting some of the team owners for meetings later in the day. 2) The view from the upper level of the Fan Cave looking back towards the entrance. Those are baseball bats that are suspended from the ceiling (if you couldn’t tell). 3) The slide, David and I went down, because Lenny made us. It’s a little uncomfortable, and I see why they’re made for kids. 4) The Cave Monster. This is how the cave dwellers watch all 2,430 games. You’re looking at fifteen 42-inch HDTVs. As you can see, they’ve watched 530 games to date, and have another 1900 to go. When the tour was complete I talked for a few minutes and told them all what I was doing and why (many of them had received an email and had already read about me). They asked some questions and I happily answered them to the best of my knowledge. Afterwards I got a picture with all of the cave dwellers. In the back and from left to right you have: Shaun, Gordon, Ricardo, myself, Eddie, and Rickie. In the front you have Ashley, Lindsay, Ben, and Kyle. Ben has been growing that beard since the 2011 All-Star game. He also has some impressive tattoos, and he let me take a few pictures. 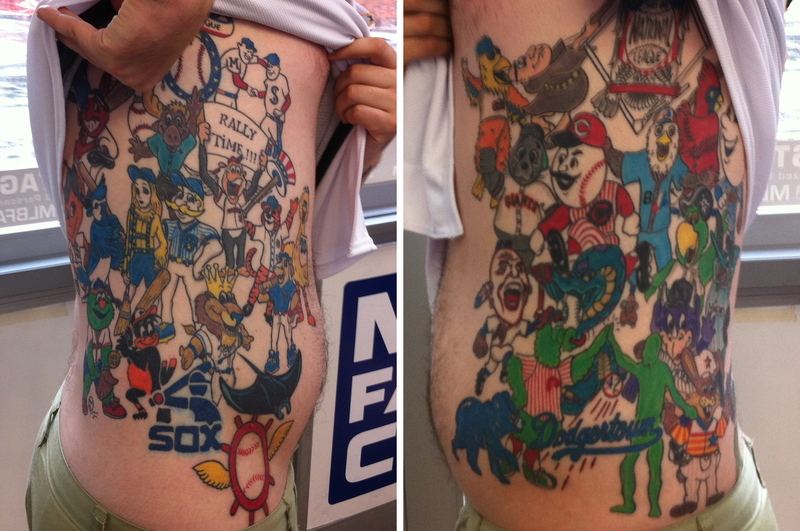 As you can see, he’s got the mascot for each major league team, including some that are now defunct, i.e. the Montreal Expos. On his right side he’s got the AL teams, and on his left side the NL teams. He told us why he got the Brewers on the AL side, but I forget. I’m assuming it’s because up to this point the Brewers have spent the majority of their existence in the American League. 1) The exterior of Lobster Joint. The red “Lobster” sign is the only signage on the exterior. 3) The bar, complete with some anchors and other miscellaneous items. 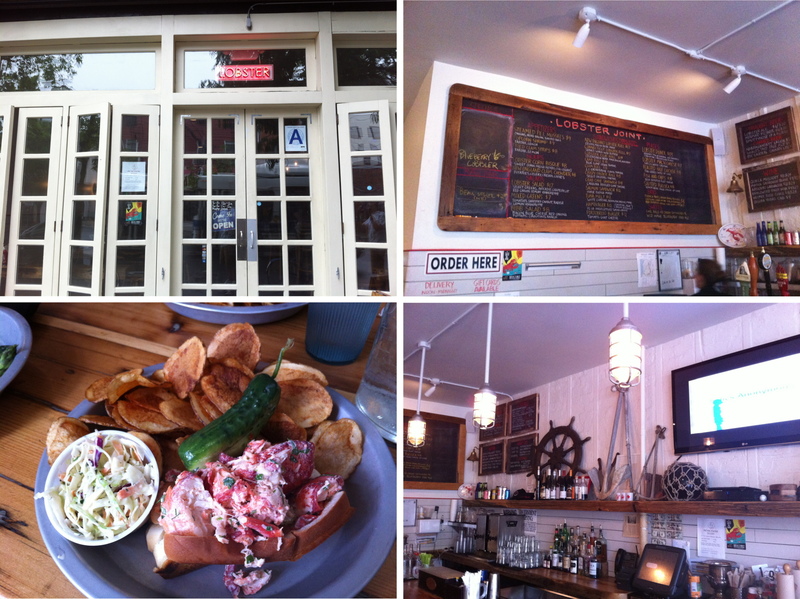 4) My lunch; The New England lobster roll. It contained lobster chunks (obviously), celery, and fresh herb mayo on a griddled bun, with coleslaw, a pickle, and house made chips on the side. The meal was $17, but it was so good that I don’t regret it. After lunch we went back to Luke’s, and I got a start on this blog post while they played some FIFA on the PS3. We left for Citi Field at 5:45, and got off the 7 train at 6:33 pm. We were cutting it a little close, but the dismal attendance made it easy to get in the park and up to the Promenade Level (the upper deck for us regular folk). David took game photo number 36, and it’s crazy to think that we’re exactly 2/9 of the way through the season, yikes. We got to our seats with about ten minutes to spare, and I was hoping that there wouldn’t be any delays. At times it looked like it was misting, but there was nothing substantial. I definitely have lucked out, but this time was pretty important. Making an unexpected trip back to NYC would’ve been costly to the budget, and could’ve made the remainder of the season nightmarish logistically. My worst fear was a cancelled game that never got made up (possible if both teams aren’t in it at the end). Thankfully both games got played, and now I can just worry about making the last 126 games of the season. The game got off to a great start for the Brewers, as they plated two runs in the top of the second inning. It remained 2-0 into the top of the fifth, when the Brewers struck again, this time with a solo home run from Travis Ishikawa. In the sixth the Crew put four more on the board. Lucroy drove one in with a single, and Ishikawa went deep again, this time a three run shot. For good measure Weeks homered in the seventh, and that wrapped up the scoring. 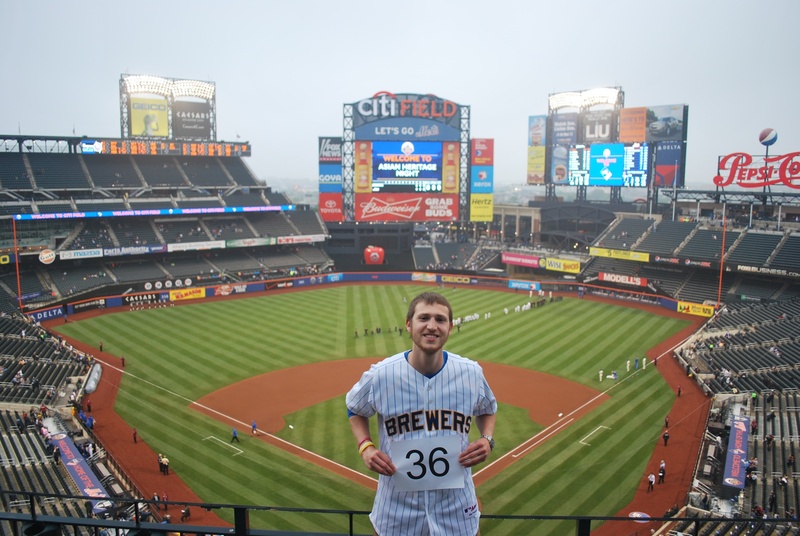 Final Score: Brewers 8 – Mets 0. Good win for the Crew and hopefully they can take the momentum into Houston, where I’ll be in ten hours. They reminded me of those carnival games so much that I was tempted to find some projectiles and try to knock them all down, but I resisted. 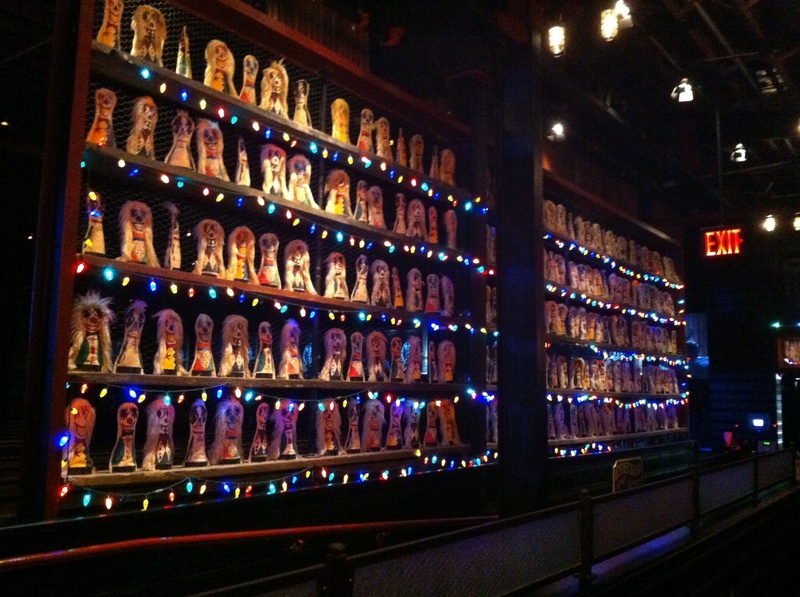 This greets you as you come into the area where you get your shoes, and the lanes are directly behind the above wall. It’s been nice Brooklyn, but I’ve got to dash. I’m leaving Luke’s at 4:20 am to catch my 6:00 am flight out of LaGuardia. I connect at Chicago’s Midway Airport, and then it’s on to Houston, where I should be arriving by 11:45 am.